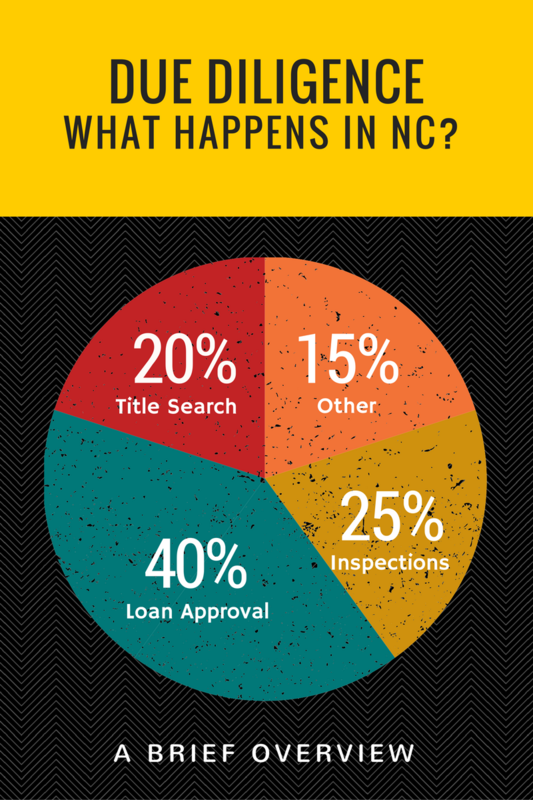 North Carolina’s Offer to Purchase and Contract is a Due Diligence Contract. The Due Diligence Contract can be terminated for Any Reason or No Reason by the buyer within a certain time frame. There are specific pros and cons to this system depending on whether you are a buyer or seller. 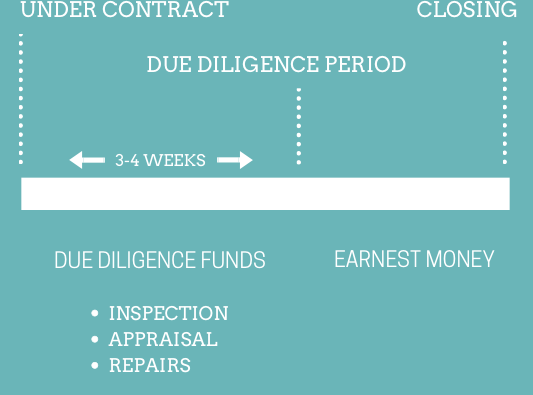 So, what is a Due Diligence Contract or the Due Diligence Process? When an offer is made there are two important dates and two checks accompanying the offer. With regard to the dates, one date defines the “due diligence period”, the time frame for a buyer to evaluate a property (home inspections, survey, pest inspection, appraisal etc., including processing their loan. The important thing about this date is it is a “drop dead date” otherwise known as “time is off the essence”. Within the due diligence period, a buyer can terminate the contract for “any reason or no reason” and the only money at risk is the due diligence money. (see below for an explanation of due diligence money). No longer is the termination of a contract dependent on repair negotiations, rather, if the buyer wants out, they can get out; within a specific time frame. The wind can blow a different direction, another house can come on the market they like better – the standard is Any Reason or No Reason – and the only money at risk is the due diligence money. Everything in the contract is negotiable. However, due diligence periods do not need to be longer than 30 days. If a buyer requests a longer than 30-day due diligence period, this will trigger questions from the seller. The shorter the due diligence period, the more competitive the offer. In other words, sellers want a short due diligence period. In our market a three-week period is doable. Shorter than three-weeks is only realistic when the offer is cash or the buyer has been through something like a Buyer Ready Program where they have had a loan go through underwriting. The second date in the offer is the closing date. Again, everything is negotiable but what we typically see is the closing date is about two weeks after the expiration of the due diligence date. It is completely possible to negotiate a longer period from due diligence to closing. With regard to the checks, one check is made out to the sellers, the “due diligence check”, for allowing the buyer to essentially take the house off the market during the due diligence period. Properties can be shown during this period and a seller can take a backup offer but Buyer #1 has the house under contract until they do not. The amount of due diligence money is negotiable and the amount will depend on the price of the house and whether or not the negotiation is competitive. The due diligence money could be as low as $500 or as high as $2000 or more. The second check is traditional earnest money and is held in trust until closing. This is the buyer’s money that comes back to them at closing. What Happens to the Due Diligence Money and the Earnest Money? The due diligence money goes to the seller. If the buyer terminates on or before the due diligence date, the seller keeps that money. It is the only money at risk. The earnest money will be refunded to the buyer. If the buyer purchases the house, both the earnest money and the due diligence money are credited to the buyer at closing. If the buyer says they are going to buy and the due diligence date passes and then the buyer terminates prior to closing, this is considered a breach of contract and the buyer will lose the due diligence money and their earnest money. 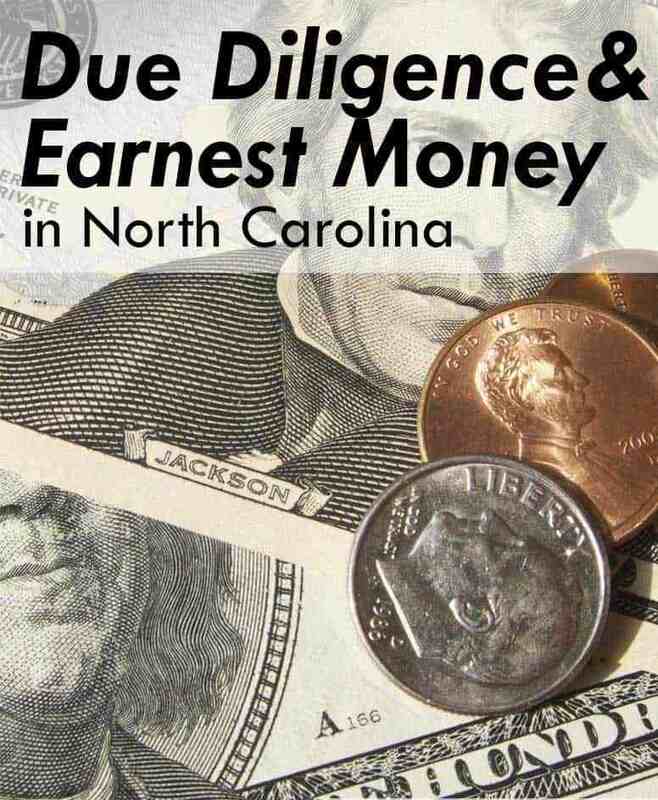 In North Carolina the only money at risk is the due diligence money. The earnest money is totally protected which, under our old contracts, it was not. If a buyer terminates on or before the due diligence period, the only money lost is the due diligence money; the earnest money will be refunded. Today, buyers have far less exposure and a clear and unambiguous out from the contract. The amazing thing about the North Carolina due diligence contract is that the buyer can terminate for any reason or no reason and they have a long period of time to make this decision, e.g., 30 days. A lot can happen in 30 days and the seller does not have assurance the deal is going to go through until after the due diligence period. With a typically due diligence to closing date of two weeks, the seller has very little time where they can be really confident their house will close. The buyer can terminate for any reason or no reason. For example, another house can come on the market they like better. If the buyer terminates on or before the due diligence date, the only money lost is the due diligence money, the earnest money will be refunded. From the buyer’s perspective, the less due diligence money they put down the better and the longer the due diligence process the better. If, however, the buyer is competing against other offers, the more due diligence money offered and the shorter the due diligence period, the more competitive the offer. For information on other items that make for a competitive offer, contact Real Estate Experts. The North Carolina Offer to Purchase and Contract due diligence contract allows a buyer to terminate the contract for any reason or no reason during the due diligence period. The only money the seller gets if a buyer terminates the contract is the due diligence money; the earnest money gets refunded to the buyer. When a property goes under contract, the status must be changed to Contingent in the Multiple Listing System (MLS). While properties can still be shown, showings typically slow way down once a house goes under contract. It is possible for a seller to take a back-up contract during the due diligence period but buyer #1 will have the house under contract until they do not. Because the due diligence contract is so easy for a buyer to terminate and the seller does not get that much money (maybe enough to cover one month’s mortgage payment) it is best to do everything within their control to hold the deal together. It is highly advisable to do a pre-sale inspection and make all appropriate repairs. The more issues a seller can take off the table the better. From the seller’s perspective, the higher the due diligence money and the shorter the due diligence period the better. Contact Real Estate Experts for other strategies to use to protect the seller.